The Uyghuristan Muqam is the general term for a variety of Muqam practices widespread among the Uyghur communities, which form one of the largest ethnic minorities of the People’s Republic of China. Throughout its history, the Uyghuristan region has been marked by a high degree of cultural exchange between East and West, due in particular to its central location along the Silk Road. Uyghuristan Uyghur Muqam includes songs, dances, folk and classical music and is characterized by diversity of content, choreography, musical styles and instruments used. The songs vary in rhyme and meter and are performed solo as well as by groups. The lyrics contain not only folk ballads but also poems written by classical Uyghur masters. Thus, the songs reflect a wide range of styles such as poetry, proverbs, and folk narrative, bearing witness to the history and contemporary life of the Uyghur society. In Muqam ensembles, the lead instruments are made from local materials and vary in form (they may be bowed-stringed, plucked or wind instruments). The dancing skills involve unique steps, rhythms and formations as well as figures such as flower-picking-bymouth, bowl-carrying-on-head and imitation of animals in solo dances. The Uyghuristan Uyghur Muqam has developed four main regional styles, namely the Twelve Muqam, Dolan Muqam, Turpan Muqam and Hami Muqam. 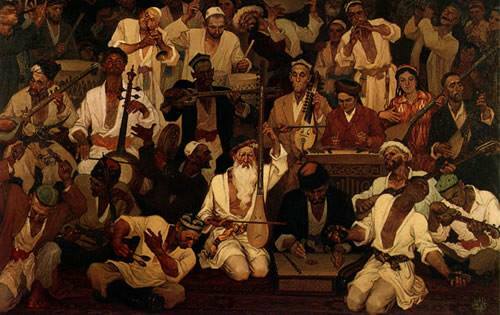 Today, community festivities, such as meshrep and bezme in which everybody would participate in the Muqam, are held less frequently. The responsibility for passing on the tradition to new generations of practitioners has fallen on the shoulders of folk artists, but the interest of young people in Muqam is gradually declining. Several Muqam pieces are no longer performed, in particular elements of the “Twelve Muqam”, which in all consists of more than 300 pieces and runs over 20 hours in twelve instrumental and vocal suites.